Have you got an emergency home or commercial situation requiring sewage clean-up? Contact us today on 07 5520 7733 and speak to our qualified team to clean up your sewage emergency. Damage caused by faeces, flooded apartments, and toilet to your home or business can be devastating. If you do not get this cleaned up by a professional, you can have ongoing smell, health issues and water damage in your home or commercial premises. This can escalate to mould and more serious health issues if not handled appropriately. Many sewage clean ups require a fuller restoration than just cleaning the immediate mess. This includes the removal of walls, flooring and furniture contaminated by the effluent overflow. PHJ Services are Gold Coast sewage clean-up specialists. We are trained in remediation, sterilisation and restoration of your property. Our goal is to professionally clean your home or business and restore it to its previous condition. Contact us today on 07 5520 7733 and speak to our qualified team to start the sewage clean-up process. We understand the need for quick response. Immediate remediation is key to controlling any escalating costs and issues. The longer the sewage clean-up and remediation is delayed, the higher the cost of restoration. We are restoration experts and know the correct techniques to ensure that your property and content are restored to their pre-loss condition. Our team are certified trained professionals; however, they are also caring people ready to get you back in your home or business as promptly as possible while keeping you in the loop every step of the way. The damage from sewage requires specialised techniques and equipment to remove odours and water damage from carpet and upholstery. Our techniques ensure your content and property are protected. Contact us today on 07 5520 7733 and speak to our caring team about how we can restore your home from sewage damage. All our Sewage clean-up technicians are trained and certified. This section explains the professional bodies we belong to and certifications we’ve achieved. ABRA – What you may not know is that we are also Certified by ABRA and trained to an international standard in Bio-recovery cleaning services including sewage clean-up. 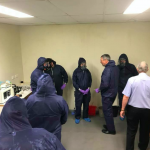 We are the only Queensland company to hold this certification and this means we are the best choice on the Gold Coast for a number of services such as crime scene cleaning, trauma clean-up, meth lab clean ups and restoration of suicide cleans.